Young orphan Lewis (Owen Vaccaro) is sent to live with his eccentric kimono wearing uncle Jonathan (Jack Black) in small town Michigan after his parents are killed in a car crash. He soon discovers that his uncle is a warlock, albeit a mediocre one. But his next door neighbor, Mrs. Zimmerman (Cate Blanchett), is a much more powerful purple clad witch. Together, they trade insults like Ralph and Alice on”The Honeymooners,” but with knowing glances as they maintain a solid but platonic friendship. 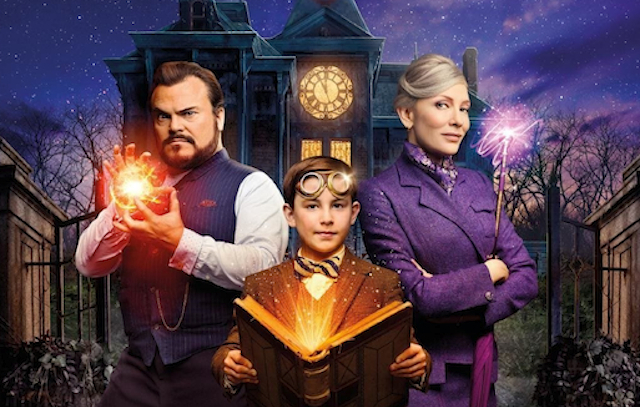 Jack Black seems right at home in this frolic full of fantasy, cocking an eyebrow and getting remarkable mileage out of simply uttering the word “creepy.” Ms. Blanchett sports an occasional French accent and wields the most powerful umbrella this side of Mary Poppins.